Lampblack, finely divided carbon, obtained by collecting the smoke produced in burning oils, fats, and resins, with a supply of air sufficiently reduced to prevent perfect combustion; the aim being to consume all the constituents Lampblack Apparatus of the burning body except the carbon, and preserve as much of that as possible. Lampblack is prepared in large quantities by the manufacturers of turpentine, from the impure resin and other refuse matters that remain after the distillation of the turpentine. These are burned in iron pots or furnaces with very limited, access of air. The dense smoke produced by the combustion is conveyed into chambers hung with sacking, upon the surface of which the lampblack is deposited. It is scraped or shaken off from time to time, and sent to market without further preparation. The illustration shows the arrangement of the apparatus generally used. A cylindrical brick chamber 10 or 15 ft. in diameter, with a conical roof, has a small opening at the top to maintain a sufficient draught to cause the clouds of smoke to ascend toward the upper part of the chamber. A cone of sheet iron hangs within the cylinder, having a small hole in its apex, through which the gases pass upward. 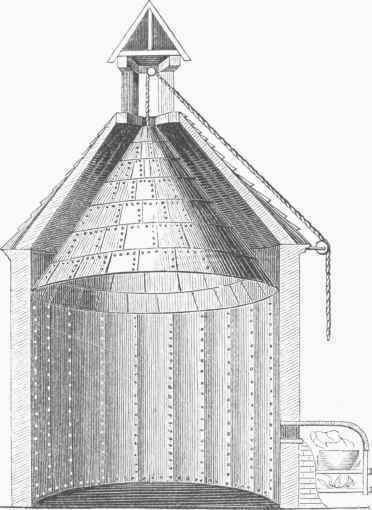 At the side and base of the chamber is a kind of furnace, above the fire in which is placed a pan containing resinous or fatty matters, which are heated to a point sufficient to convert them into vapor, and then the vapor undergoes sufficient combustion to be deprived of its hydrogen, while most of the carbon is unconsumed. The smoke ascends into the chamber, and is mostly deposited upon the hanging canvas or sacking, and upon the inner surface of the iron cone, from which it falls after a certain thickness is collected. The cone is so held by a chain and pulley that it may be lowered, which operation scrapes the lampblack off the sacking. The lampblack thus prepared is not pure charcoal, as it is mingled with resinous and bituminous substances, with ammoniacal and other matters. By heating it to redness in a vessel permitting no access of air, the impurities are driven off, and an almost pure impalpable charcoal powder remains. Other kinds of black are used in the arts, such as Spanish black, which is made from cork; vine black, made from vine tendrils; and peach black, made from peach kernels, which has a bluish color. German or Frankfort black, used in making copperplate ink, is said to be made by carbonizing a mixture of grape and wine lees, peach kernels, and bone shavings.